There is this illness amongst many people, and we’ve see this in the character of critics of Islam as well. Since, they can find no qualm with the essence, basis, and fundamentals of something they must pick on the minor details that alone may seem unusual, yet in full context are the salt and pepper of all that is beautiful. People who wish to defame Islam will find nothing that contravenes logic in the basics and fundamental of this beautiful religion. Instead they spend their entire lives and the focus of their life’s workon debating wheatehr a word meaning raisins or women. This seems to be no different when it comes to this issue here in Ottawa with our Imam Khalid may Allah protect him and aid him. People ignore the fact that he is a qualified, well versed, Imam and scholar of Islam. Something Ottawa has been starving for for some time. Yet when people have some concerns about the community at large (justifiably or not) their actions reflect how much they really care about these concerns deep down in side. In other words, no action means no care. So why all the noise? Well as one of our listeners said, “Muslims like to talk”. And in the case of Imam Khalid treat him like “a drop off box”. Now of course we can’t expect the Ottawa Citizen to realize this. Far from them being a balance source of information about Muslims, it is also a non-Muslim entity that could not possible understand the intricacies of Islam and Muslim (whom have shown to be very complex, socially). But what we did expect, naively as it was, that the Muslims who had their concern would have addressed it where it matters; within the Muslim community. I can’t imagine, now that the Ottawa Citizen has published this article that we will be seeing droves of Imams crawling out of the wood works. Nor would we expect that the general Ottawa public will have something valuable to contribute when it comes to managing a Masjid. The reality is that the situation we are in is a result of our own apathy. Our own indifference, our own laziness, our own ignorance, and our own inaction. Unfortunately, because some of our elders have lived their lives with indifference, it is natural that our youth would follow suite, except those whom Allah guides, of course. There is no denying that the youth are in a dire situation, and a dire need of spiritual uplift. But the citizen? Really? They could have come to us, here on Salam Ottawa, or the Muslim Link, or other imams in town, or other community leaders, if they felt the Muslim public should know. In fact, I would love to have them on Salam Ottawa in order to properly hear what they have to say. I seriously doubt the Citizen had the Muslim youth’s interest in mind when editing their piece. Perhaps these youth really do have something to say. So how about those youth head over to Slam Ottawa (the only Muslim Radio program in Ottawa) to have their say heard without the editing hand on the citizen puppeteering Muslims against each other. Now it is true. The youth are in a totally differnt dimension than many of the Imams that are being offered as spiritual guidance. But then they are also in an absolutely differnt dimension than many of thier parents. So what is the solution? Those who talk and care should be stepping up to take on the resoponsibility of building Muslim community. I’m not talking about mosques, by the way. Not even Islamic centers. I’m talking about building people. From our elders and our parents to the community works and the youth. everyone needs to step up and be Muslim in all that the word means. Be a Muslim in our behaviour. Be a Muslim in our daily actions. Be a Muslim in how we feel about things. The prophet peace be upon him said: “Whoever does not give care to the affairs of the Muslims is not one of them”. The arabic word is beautiful in this hadit; Yahtam. It does not simply mean “care” in the sense of a thought or feeling. It means those who move either internaly or in their actions when the Muslims are in need. So where are teh people of himmah or ambitoon and action? Well, they are busy with thier lives. Oh, so their family and children… No, no no. Children? The school takes care of them. Then I drop them off after school to the brother to learn quran and that’s it. Where is the care and action with your children? The onse who now have grown up and know no where better to turn than the Ottawa Citizen. Why aren’t we as a whole community caring for our community? Don’t Forget Earth Hour this March 28, 2009. And just like many of the special hours, days, weeks, or months of the year that draw attention to important things we should be practicing the encouraged actions and habits all year round. It is our responsibility. Allah says in the Qura’an: (and we presented the “trust” (Amanah, responsibility, stewardship) to Heavens, and the Earth, and the mountains, but they declined to uphold it, so we had mercy upon them, so mankind upheld it” Al-Ahzaab 72. As stewards and representatives Allah has given us guidelines and rules to follow. One of which is against mindless, wasteful and extravagant consumption. Islam teaches us to exhibit justice and conserve, and preserve what we have been given as a responsibility. Allah says:“And don’t be wasteful” and He also warns us that “In deed those who are wasteful are the brethren of devils”. Lets cut the waste and hit the power switch off when we don’t need it. Keep on Greening, Muslims. We want to hear from YOU on what you think about Imam Khalid! Do you think things are as dire as people say it is about the youth? Do you think the selection process was the right way to appoint an Imam? Do you feel that Imam Khalid is to blame for what has happened with the Ottawa Mosque, and the youth? Do you have something you think the Muslims of Ottawa have totally missed that you want them to know? We’ll be talking to YOU, and taking YOUR calls this Tuesday between 5 and 6PM. or comment Below this post. 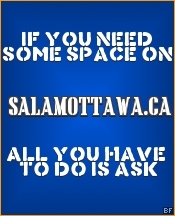 http://salamottawaforum.googlepages.com/trust_INSERT.mp3You don’t have to listen to Salam Ottawa. Sure we’re the only Muslim Radio Broadcast in Ottawa, but there are far more reliable sources about Islam and Muslims on the air waves. Imam Zaid Shakir’s event was a full house, with entertainment that is worthy of a paid ticket event. And a first of its kind in Ottawa, as a collaboration between the UofO MSA, and the Revival Series from Reviving the Islamic Spirit. The Event really showcased the level of professionalism that the MSA, and quite generally, the Muslims of Ottawa are capable of. Imam Zaid Shakir rarely disappoints, and the ideas he researched and presented at the event titled, “Can We Make Islam Relevant in the 21st Century? Yes We Can!”, were brilliant and quite worthy of a 21st century intellectual discussion. A discussion which we really need to follow up with, and perhaps will be a focus of one of our shows in the near future, insh’Allah. Here’s a tip that is easy, good, will save you money, save on energy, and with the right intention gain you rewards from Allah. Unplug. Yup, unplug. I don’t mean unplug from the hectic daily life (which would also be good for you on many levels), I mean unplug your “stuff”. Do it know before he stops you. Who? The phantom of course! I bet you didn’t know that it uses electricity even when you’re not using it. That’s right. Just having you’re devices plugged in draws electricity form the circuit. This is called “Phantom Power”. Electrical current that continuously flows through your devices even when you are not using them. Ask yourself, “how often do I use my printer, scanner, fax” (do people really still use faxes?). How about your cellphone charger you keep in the wall once you’re done charging. ☆ Use a power bar with an off switch to plug all the devices that you will not be using very frequently (e.g., cellphone charger, fax [really? Still got it? ], scanner, etc) and unplug, or hit the power switch when you are not using them. ☆ Your printer, scanner, and many other devices have a master power switch, keep it turned off until you need it. ☆ As for your TV, DVD player, PVR, Cable Box, etc, or anything that stays plugged in over night (up to 10hrs/day) without every being needed or used: plug them into an electrical timer, and set it to cut off the power during the hours that you will not need or use them. E.g., over night, or while you’re at school or work, etc. These tips will save you from the Evil Dreaded Phantom Power, and save you some dough so you can donate to Salam Ottawa. Enjoy you newly found wealth. Keeping on greening, Muslims. “What do I do” you say. Unplug. It’s that simple. Plus, you could reduce your electric bill by 10 percent a year. For more than 30 years Imam Siraj has traveled extensively at the invitation of other Muslim leaders and organizers in the U.S. and abroad. He freely and passionately shares his love and knowledge of Islam -often booking back-to-back speaking engagements on a weekly basis. There is no doubt that his demanding schedule factored into the development of his health condition. As such, it has become paramount for him to make important lifestyle changes, which includes taking a sabbatical from some of his responsibilities, in order to balance his life and improve his overall health. As Salamu Alaikum, Dear Brothers and Sisters! My diagnosis is not as bad as it sounds on the surface. Many men have been cured from prostate cancer. My doctors are very optimistic about my cure, and so am I. Insha’Allah the treatment should last about two months. But you and I know that the cure is in the Hands of Allah. If Allah heals me, I will be very grateful. If Allah doesn’t heal me, then I will be patient and happily accept my fate. This is the way of the Believers. I am looking forward to full recovery and getting back to work in the not-too-distant future, insha’Allah. Many people will ask the question, what can we do? Don’t waste your time feeling sorry for me. Make du’a. But don’t just make du’a for me. There are a lot of Muslims, men and women, with cancer (and other diseases). Make du’a for them also. There are so many among the elderly, who need our help, make du’a for them. There are so many Muslims who have lost their jobs, lost their homes, make du’a for them! Beyond the prayers, go visit the sick, those in prison, and others in need. Get involved more with Islamic work. Support organizations like MANA, ISNA, ICNA, MAS, CAIR, SIFCA, the community in association with Imam Warith Deen Mohammed, the community of Imam Jamil Al Amin, etc. Support good brothers and sisters, like Mauri’ Saalakhan of the Peace and Justice Foundation. Support Islamic education and schools. If you want to help Imam Siraj, then help support his Masjid, Masjid At-Taqwa, in Brooklyn, New York and all the other struggling Masjids throughout America. Every challenge we face in life presents us with many opportunities for growth. With a heightened awareness and sensitivity about health-related issues, I will feel better when we, as an ummah, learn more about our health. We have to be very careful about the foods we consume! I urge all of us to cultivate healthy appetites such that we begin to love and crave foods that are good FOR us and eliminate foods that are not. I intend with Allah’s help to share information with you in the coming weeks about our health. On behalf of MANA, I encourage you to lend your support to our growing Organization. Every MANA project is structured to strengthen American Muslim communities. The SHARE Centers, Healthy Marriage Initiative, Community Reentry Program, and Healing and Reconciliation Project all need input and active service urgently. Please contact the MANA office to find out more and look for regular updates in our newsletters, insha’Allah. In closing, I am humbled and very thankful for all the prayers, and well wishes of the Muslims, and am very appreciative for all the help extended to me and my family in the past. Alhamdulillah! I am also overwhelmed with gratitude that a number of you want to lend financial support, and have asked how you can do that. Online donations can be made here, or feel free to correspond with me directly at Siraj Wahhaj, P.O. Box 312264, Atlanta, GA 31131. Thank you kindly. May Allah guide and protect us all. TO FIND OUT HOW TO DONATE. The last point is where I want to remind myself and our listeners about not loosing opertunities. We really should not waste such oppertunities that Allah provides us with as reminders, less we become the reminder to other at a time when we are not ready to be. My wife and I had the opportunity to attend a weekend conference on February 14-15 at Ottawa’s Carleton University in which a brief study of Imam Tahawi’s “al-Aqidah al-Tahawiyya” was presented. This classical manual, venerated by Muslims scholars and their students for centuries for its accuracy and clarity, outlines in a concise format the basic tenants of the Islamic faith. The two scholars discussing the text were Shaykh Faraz Rabbani and Shaykh Omar Subedar, both hailing from Toronto. I have to say that rarely have I attended an Islamic teaching session that has exhibited such high levels of professionalism and scholarship. Every single moment was jammed packed with information which further illuminated Imam Tahawi’s book for my wife and I. To read the full article pick up the next edition of the MUSLIM LINK – distributed on March 6, 2009. United Nations of America? by Thaiba Ahmed Abdulrahim. New survey says Muslims favour broader powers for the UN but would like to see it free from US control. An interview with Keith Ellison about Gaza really showed me that this man doesn’t only stand for good values, but is also very wise and intelligent in going about his cause. Keep it up bro. We are short not on politicians, but on intelligent, wise politicians. A group of activists under the banner of “Free Gaza Movement” are on their way to Gaza on an emergency mission abord the “SPIRIT OF HUMANITY” ship. They are carrying with them desperately needed doctors, journalists, human rights workers, and members of several European parliaments as well as medical supplies. A previous attempt to provide such aid by an international ship was violently attacked by the Israeli Occupying Forces. On December 30 Israeli forces purposefully and repeatedly rammed the unarmed ship causing seriouse damage and endangering the lives of the humanitarian air crew. Israeli attacks on the Gaza Strip have injured thousands of civilians and killed over 800 people, including scores of women and children. SPIRIT OF HUMANITY is coming to Gaza. DEMAND that Israel immediately STOP slaughtering civilians in Gaza and STOP using violence to prevent human rights and humanitarian assistance to the Palestinian people. Imam Solaiman Gamal, tells the ottawa community to support the new Egiptian Imam. 211 is an easy-to-remember, free and confidential telephone service providing access to trained bilingual information and referral counselors who can direct the caller to a range of community organizations, social services and government agencies. You may have seen advertised on our show and on other local Muslim media the Sadaqa Food Bank that opened up not too long ago. Unfortunately I did not get a chance to discuss it much on previous shows, but it is incredibly important to realize the barakah or blessing that is in this Food Bank. Allah has provided us with a great opportunity to help our brothers and sisters right here at home and this opportunity should not be overlooked. There was an article in the Muslim Link’s April 2008 issue on the Sadaqa Food Bank that I would like to share with you if you did not get a chance to read it yourself. The launch of a new halal food bank in Ottawa is giving local Muslim families the opportunity to nourish themselves with Islamically permissible pickings all year round, for the very first time.